"Two years after my mother died, my father fell in love with a glamorous blonde Ukrainian divorcee. He was eighty-four and she was thirty-six. She exploded into our lives like a fluffy pink grenade, churning up the murky water, bring to the surface a sludge of sloughed-off memories, giving the family ghosts a kick up the backside." Reserved for the Two Worlds Virtual Book Box started by loveamystery. On its way to Canada. Enjoy! It has arrived! Thank you very much. I look forward to reading it. P.S. Thanks for the beautiful post card too. I just discovered it. This was quite a story, both funny and serious at the same time. I enjoyed it and would recommend it. I have lent it to someone who doesn't use a computer, so she won't journal it. Got the book back and am saving it for a VBB. This book is now on its way to someone who chose it out of a bookbox I am participating in. Enjoy! RABCK 10 in the 52 Weeks 52 RABCK challenge. Sending out to the runner up of my RABCK Bookbox draw, its off to Australia so has done many many miles in its journey so far. part of the journey. Oh and of course I’d love you to read it and enjoy its tale. Off to Australia as part of my New Year Book RABCK, hope you enjoy and find somewhere/someone to release this. Oh, what a nice surprise the postie left for me this morning! I'm really looking forward to reading this wishlist book (which is actually in New Zealand :) at the moment) and then helping it on it's way to Mexico. My first hitchhiking book...a really great idea. Thank you also for the lovely King's College bookmark. An enjoyable story about human nature and the struggle to survive and better one's lot if possible. This book has been sent to another bookcrosser as a surprise wishlist book and to help it continue it's journey. And it has arrived safely here in Pennsylvania - what a surprise! I knew that some people were doing this hitchhiking book idea, but never thought I'd be a part of it. It will stay here for a while till I read it though. Thanks and thanks! Just finished it last night. At times the book annoyed me because the people were behaving so stupidly... but by the end I understood them better. 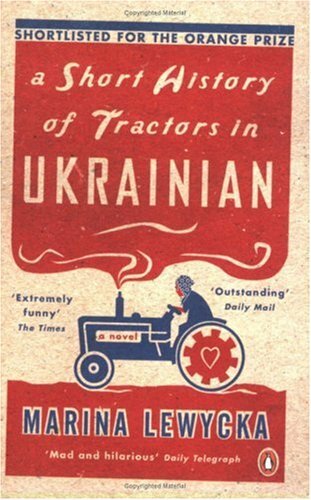 I appreciated the way the author wove the present day, the past, and the history of tractors into one story. I'm not sure I would say I think it's funny exactly, but there were some funny situations. I think this will be traveling to California with my sister, who is visiting in June. It will be getting closer to Mexico! You thought I forgot about this, didn't you??? I handed this off last night to my sister, who is visiting but lives in San Diego. She is going to try to find someone to help this book reach its desired destination: MEXICO. She gave it back. Just wasn't going to happen.